Here are some of the most notable stories from this year’s draft. There was no doubt in anybodies mind that Yakupov was going first. He put up numbers in the OHL that are comparable to former Sting member and 2008 first overall pick, Steven Stamkos. The only question going into the draft was if the Oilers would move the pick so they could get Ryan Murray in the top 5 or package it in a deal to acquire the coveted top 4 defenseman. 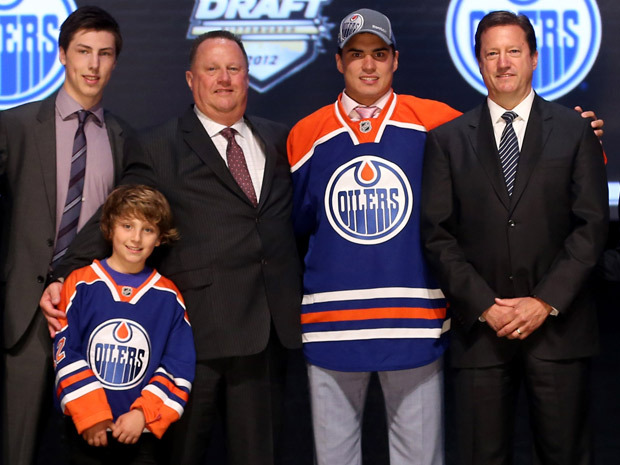 But now that Yakupov joins Oil City the Oilers could potentially boast a top line of first overall pick with Hall (2010) and Yakupov on the wings and Nugent-Hopkins (2011) up the middle. Edmonton better start winning soon though because once their young core’s entry level deals run out, a Black Hawkesque decimation is imminent. I am a huge Leafs fan so when the number five pick came around I was on the edge of my seat with anticipation. My first reaction when they took Morgan Rielly was disappointment because I thought Filip Forsberg would look good in the old blue and white. But the more I hear about the kid the more I like him. I’ve watched some of his highlights on youtube and first thing I notice is how fast he skates. He is an incredible skater and puck handler and probably the best available for skill blue liners in the draft. I think he may even have the highest ceiling of any defenseman in the draft, even Murray. Murray is by far the better defenseman now, but Rielly has the raw skill and strength that translates to an elite puck rushing defenseman like a Paul Coffey or Erik Karlsson. Skill set wise he reminds me a lot of current Leafs prospect Jake Gardiner. Leaf biases aside I do think that Rielly has the potential to be at least a top four defenseman if not greater. Just before the eighth pick of the draft the story of the night unfolded. It was announced by some Bettman that the Carolina Hurricanes had traded the eighth pick, Brandon Sutter and Brian Doumolin. In return the Hurricanes got 2006 second overall pick Jordan Staal. This would give Carolina two of the four Staal brothers. I think this was a great trade for all parties involved. Pittsburgh got a great return of young talent and it frees up significant cap space for them to go after all star winger Zach Parise. Staal gets a chance to finally get out of Crosby and Malkin’s shadow and get top 6 minutes as he rightly deserves. He also gets the unique chance to play with his brother. The Hurricanes got a great two way center that is starting to hit the prime of his career who is a great penalty killer, will spend time on the power play and can put the puck in the net. There was no clear cut favourite in this trade as it was beneficial to both teams. This guy was ranked as high as second overall and a sure fire top 5 pick. He has otherworldly skill and plays in Sweden’s top league, so it was a surprise to say the least that he dropped right into the laps of the Washington Capitals. Washington seems like a good fit with their deep pool of young talented European forwards that features fellow countryman Nik Backstrom. He could be the steal of the draft. Probably with the thinnest farm system in the NHL, Calgary was holding on to the 14th pick and looked to finally add a high level prospect to the system. Instead they traded down to the 22nd pick for a second round pick. But what I found was the head scratcher was that they chose Mark Jankowski, the youngest player in the draft who’s only opponents thus far have been high school students. It was a risky pick to say the least. I am all for Calgary getting the extra pick to stock the shelves but from a team that boasts draft busts such as Tim Erixson (23rd 2009 still a good prospect but waived by team), Greg Nemisz (24th 2008) to name a few, they should really focus on quality over quantity or better yet both.